There is no Leningrad 5, in case you've been looking at the numbering. Or at least, nobody I know has seen one. My guess is that it was developed but never marketed, or was made in such small numbers that few exist. There are three missing numbers in the Leningrad line: 3, 5 and 9; each missing number occurs when there's a major redesign of the meter. This is the first of the Leningrads to use a CdS cell. Up until now they've used selenium. This one also changes the design, from modern to post-modern. 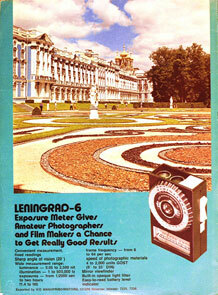 Whereas the Leningrad 4 copied the look of a Gossen Luna-Pro, this one looks similar to Foto-Quelle's various Revue meters, and some of the 70s era Showa-Koden Unittics. Very rectangular, very simple. There are several interesting things on this unit. First is the main butterfly switch on the side is now a spring-loaded rocker switch. If you push on the upper portion, the meter switches to the High scale; when you let go, the needle locks in place. When you push the lower portion, the meter switches to Low scale and the needle swings free; when you let go, the needle locks. There's also a button below for battery check, and a red mark on the meter scale showing where the needle should go. The next big difference is that they moved the incident diffuser from being a separate accessory and made it a sliding panel on the front. If you slide it in front of the cell, you get incident readings; if you slide it to the other side, you get a regular reflected reading. Finally, they added a little waist-level viewfinder; the lens is in the center of the meter next to the photocell, and the viewfinder is in the middle of the calculator dial; so you can see what you're aiming the meter at. The viewfinder is suprisingly bright and clean. You'll get parallax error on closeups, but you can work around that. Mine came with the original Russian battery still in it, and it was just starting to leak and corrode the chamber. I get a lot of stuff more cheaply because people don't remove their batteries. Along with the Leningrad 1 and 2, this appears to be the meter of the Leningrad line. It's very well regarded and long-lived. The subsequent two versions wouldn't appear until the 1980s.